One country's sacrament is another's illicit drug, as officials in South America and the United States are well aware. 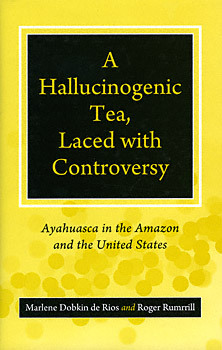 For centuries, a hallucinogenic tea made from a giant vine native to the Amazonian rainforest has been taken as a religious sacrament across several cultures in South America. Many spiritual leaders, shamans, and their followers consider the tea and its main component--ayahuasca--to be both enlightening and healing. In fact, ayahuasca (pronounced a-ja-was-ka) loosely translated means "spirit vine". Marlene Dobkin de Rios is a medical anthropologist who has conducted fieldwork in the Peruvian Amazon and the coast on plant hallucinogens and healing. She is Associate Clinical Professor of Psychiatry and Human Behavior at the University of California, Irvine, and Professor Emerita of Anthropology at California State University, Fullerton. De Rios has spearheaded research on the plant hallucinogen ayahuasca in Peru, Brazil, and the United States. The author of six books and several hundred articles on hallucinogens and culture, she resides in Sourthern California.